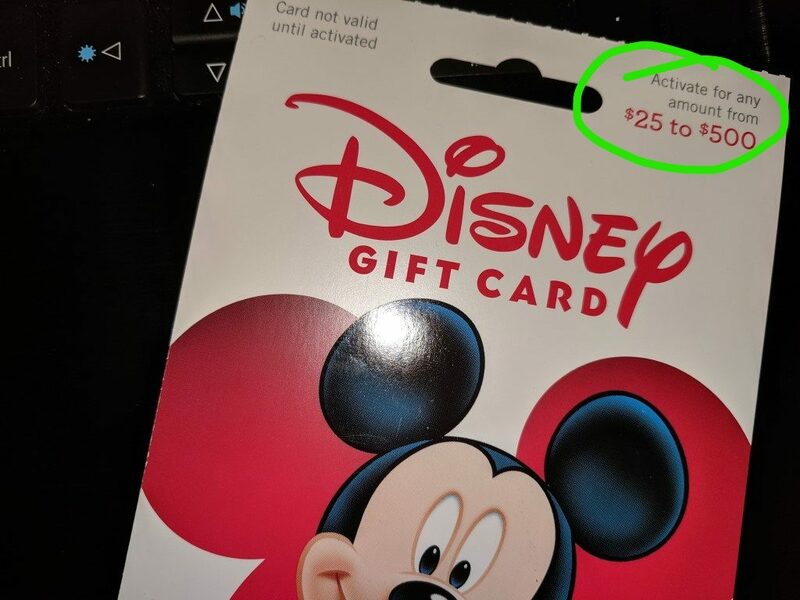 I had some rewards built up in my ledger, so I decided to cash in for some Disney gift cards today. Usually I’ll wait for a specific deal, but haven’t seen one in awhile, so I decided to piece a deal together for myself. Follow along to learn how to get up to 20% off! First of all, you need to be signed up for Best Buy Rewards. It’s a free program that will earn you at least 0.5 points per $1. The more you spend over the year, the higher your status will be in the program. At $1500 spent, you will begin to earn 1 point per $1, and at $3500, you get 1.25 points per $1. I reached the highest tier toward the end of 2018, but still enjoy that status in 2019, so I’m not sure when that will reset. Each 250 points is worth a $5 reward, which you can use toward your next gift card. At my ElitePlus level, I will earn $2.50 in Best Buy Rewards on a $100 gift card. You used to be able to use your certificates to buy gift cards, but now you will have to save them for merchandise. I plan to use mine to buy Disney movies! Of course you’ll need to sign up for Swagbucks in order to do this deal. You will get an actual QR code for the cashier to scan when you check out. This will earn you SB in two different ways. 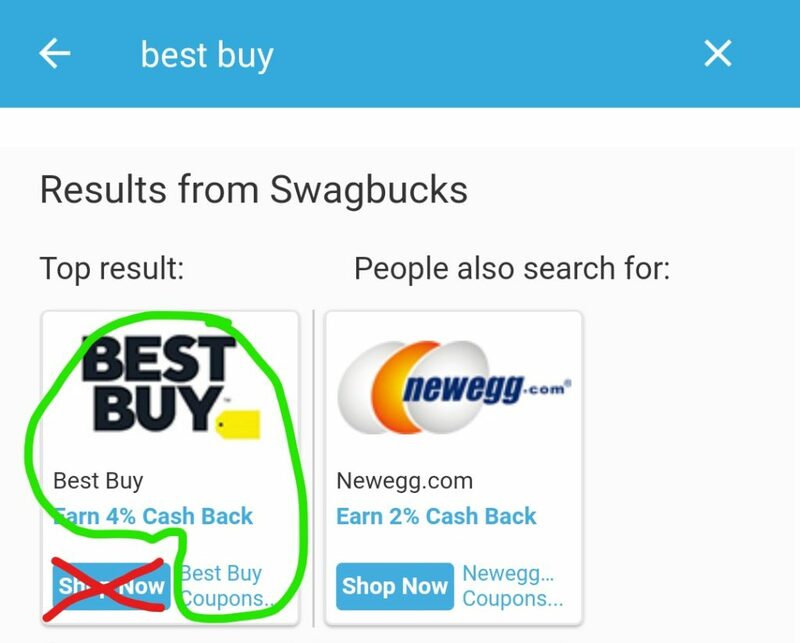 First, Swagbucks is paying out 4 SB per dollar at Best Buy right now (January, 2019). Second, you earn a bonus depending on how much you spend at Best Buy. Spend $50-$99 and get 250 SB, 750 SB for $100-$499, and $500 or more will earn 1,500 SB. The sweet spot for gift cards is obviously $100, because $500 will only get you double the SB instead of five times. I will get 400+750 SB for a $100. For easy conversion here, I’ll call that $11.50, but I usually cash out for virtual Visa cards which have a 1%, 2% or 13% (on the first $25 card each month) discount. Whenever I go to Best Buy, I try to find the best card to use on the transaction. 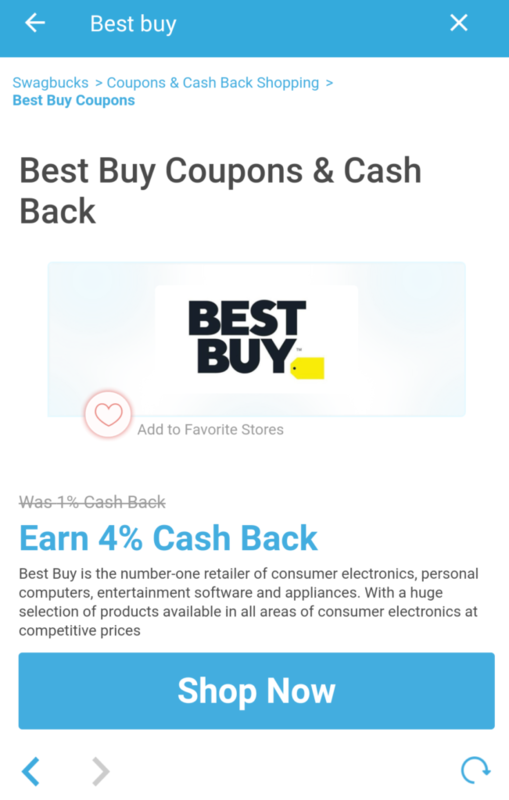 Lately, Chase Pay has paid out bonuses on transactions at Best Buy. However, there aren’t any deals for Chase Pay, and I don’t have any cards in my arsenal that earn more than 1x at electronics stores, so I had to get creative. Bryan applied for the new World of Hyatt credit card, so we are working on the minimum spending requirement of $4000 in the next three months. Shouldn’t be too hard with an annual insurance bill plus taxes coming up in the next three months, but every little bit helps. For my transaction, I picked a $100 MasterCard gift card I had purchased at Safeway with our American Express Blue Cash Preferred for 6% cash back rewards. That’s $6 per $100 gift card, more if I’ve earned fuel rewards on the transaction at the grocery store. So taking all of the different rewards earners into account, I’ve saved exactly $20 on one $100 gift card! More, really, if you count the possible fuel rewards or discounted virtual Visas when I redeem my Swagbucks. Sometimes when calculating rewards, I have to take the discount of one into account when calculating the other, but each of these discounts is mutually exclusive of the others, the best kind! 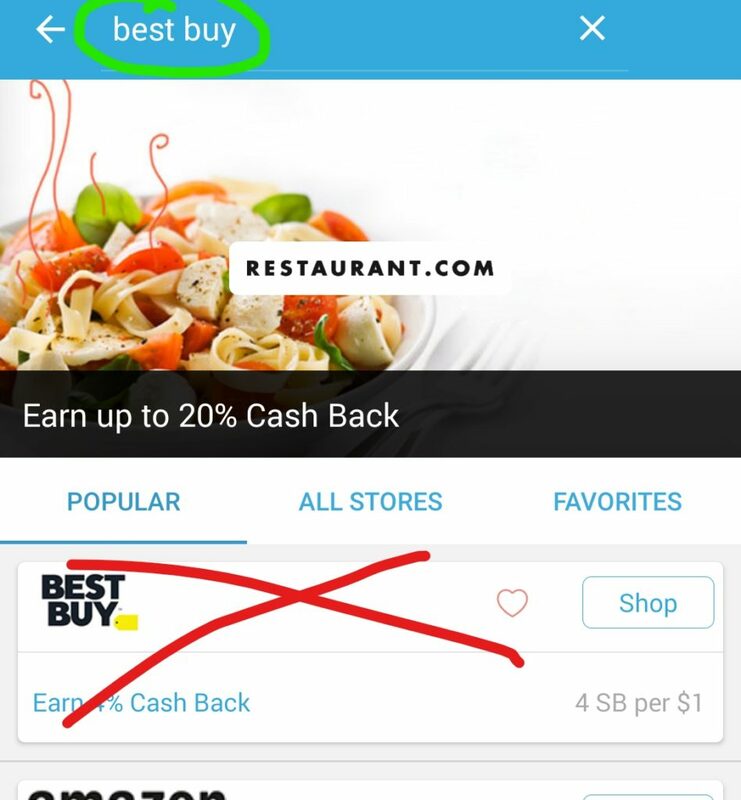 On the Swagbucks app, you can’t just go to Best Buy on the Shop tab. It takes a bit of finagling to get to your QR code. Type “Best Buy” in the search bar at the top. On the next screen, tap anywhere in the box except the “Shop Now” button or it’ll open BestBuy.com. Hit the back button if you accidently open BestBuy.com. Instead, you should see the same as below. Scroll down to find this graphic and tap the “Get Code” button. Once you have the QR code on your screen, you can use it in the store straight from the app, snap a screenshot, or print it out. It is only good once, and you can only get the bonus once per day. You’ll need to repeat these steps to generate a new code when you do this deal the next time. If you already have at least 250 Best Buy Rewards built up in your account, you’ll need to issue a certificate by logging in online. You can do this from your phone, but you’ll want to have it done before you go to the store, because it can take some time to issue the reward, from a couple of minutes to an hour. 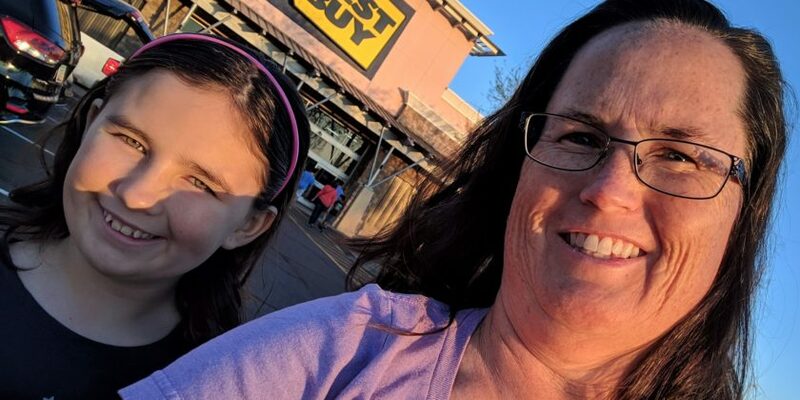 As of last month (February, 2019) you can’t use your Best Buy Rewards certificates towards gift cards, only merchandise. Make sure you know ahead of time what method of payment you are using. This step gets insanely complicated when you are using Chase Pay because you need your phone to scan the Swagbucks QR code plus your Chase Pay QR code. However, it’s much easier if you choose to pay with a Visa or MasterCard gift card you’ve already gotten better rewards on, like purchasing discounted Visa gift cards at an office supply store with your Chase Ink card that earns 5x rewards or buying them at a grocery store for fuel rewards with a card that earns 5x or 6% like ourAmerican Express Blue Cash Preferred Lastly, use a card on which you need to hit a minimum spending requirement, like our new World of Hyatt card. At Best Buy, choose a variable load gift card from the rack. Remember, $100 is the sweet spot, so if they don’t have variable load cards, just choose two $50s or four $25s. You won’t be able to use Best Buy Rewards certificates on gift cards, but you could do a separate transaction and buy merchandise with them. This part can be extremely frustrating and flustering, so make sure you’ve reviewed this section. Perhaps write down the steps to remind yourself what comes next. The cashier’s job is to get you through as quickly as possible, so make sure he or she doesn’t rush you and don’t be afraid to go back a step or two if something is skipped. Give the cashier your Best Buy Rewards number, usually your phone number. 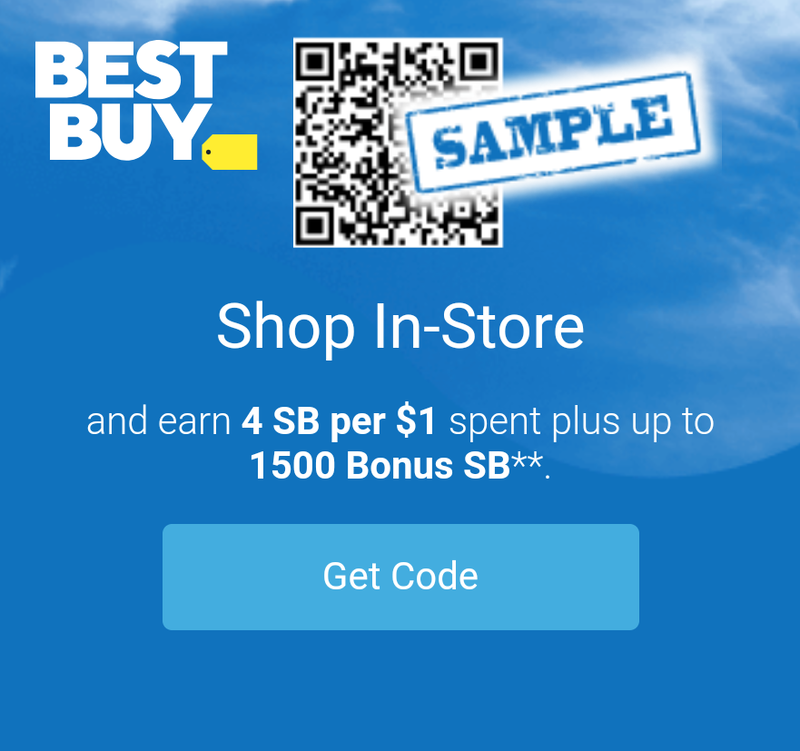 I’ve had cashiers skip steps all the time, sometimes the QR code, but most often the Best Buy Rewards number, which is a bit odd. I even had one cashier put in the wrong amount for the gift card. Don’t be afraid to make sure your cashier does it correctly before you pay. 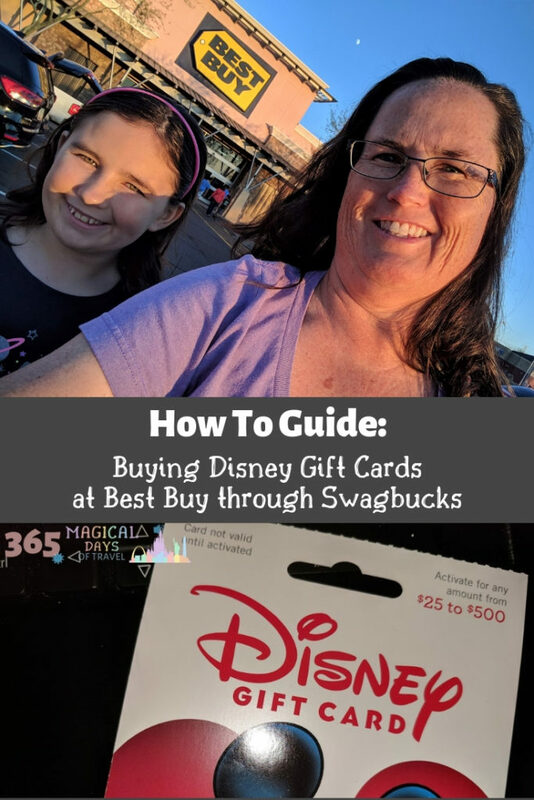 This seems insanely complicated, but rest assured, you will get the hang of it and start seeing the rewards roll in, especially in the form of Swagbucks. The bonuses usually post within a few days, but the Shop SB will take a full month. I keep a spreadsheet of my rewards from Swagbucks, cash back portals, free Target gift cards, credit card cash back, and any other “found” money, because I can’t technically use these forms of payment in the store at Best Buy. They just get rolled into our general budget, but I want them to count toward our Disney trips, of course! Taking these steps, I get more bang for my virtual buck and save an additional 20%!